Polaris ATV Forum > Polaris Model Specific Discussions > Polaris Sportsman > Softer rear shocks/springs? Hi all, I just got my first quad. 1998 sportsman 500! Lovin it, but the ride is really rough. The shocks only compress about 1inch or less with 225lbs bouncing on her. The shocks look older but the bright blue springs look much newer. I suspect maybe somone replaced the springs with HD springs. 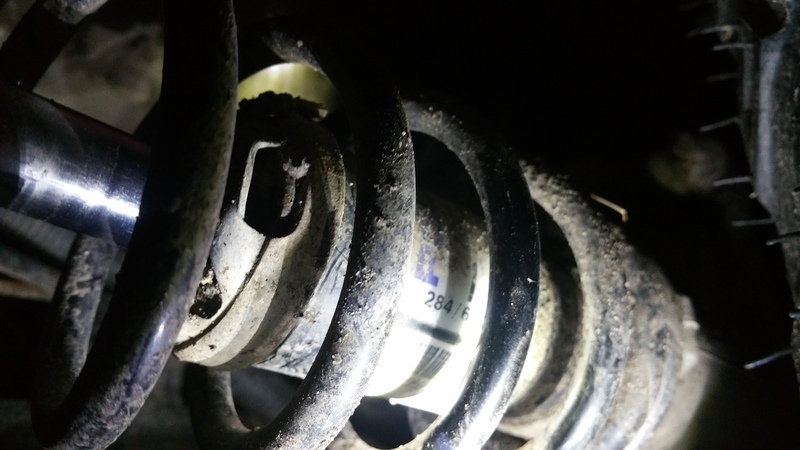 Shocks are adjusted to softest setting. All I can find are $100-125 coil over replacements. I just dont have $500 to spend. Are there any aftermarket cheaper alternatives? does anyone know which years/models have interchangeable shocks/springs for my atv? Then maybe I could ebay some used parted out ones. I just need to soften this ride up alot for sport riding. Any other ideas?? Last edited by Unitoo1; 03-29-2016 at 12:03 PM. 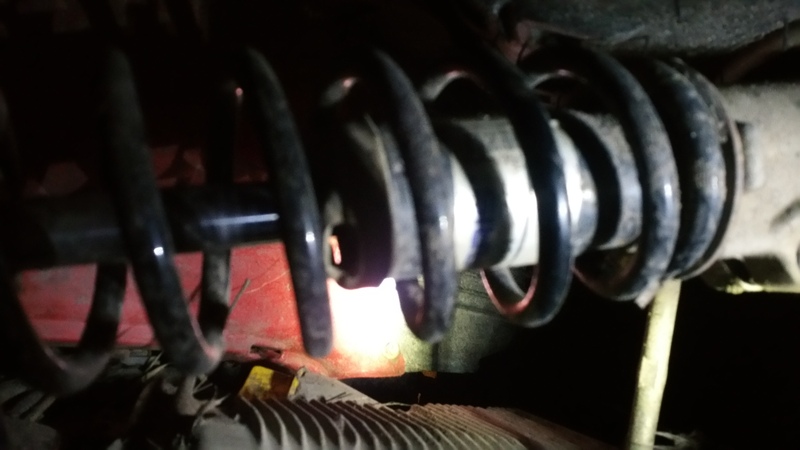 Did you check the preload adjustment on the rear shocks? Mine - 2013 polaris sportsman 800. 28x9x12 and 28x11x12 ITP mega mayhems on 12x7 ITP black steel wagon wheels, 4500# venom winch, rear tool box. Hers - 2008 Yamaha wolverine 450. 26x12x12 super grip super lites rear, 26x9x12 super grip super lites front, 1 1/2" spacers all the way around, pro mark 3000# winch on custom mount, HMF pipe, K&N air filter, jet kit, custom rear rack with seat/toolbox and 5 gallon gas can mount. Daughter - 1999 polaris scrambler 500 4x4. 22x12x10 bear claws rear, 23x7x10 bear claws front, reinforced rear swing arm (long story), 4" lift kit in rear, 3000# promark winch on custom by me front bumper, rear cargo box. Yes, they are set to the softest settings. Bright blue springs...sounds like someone has put RZR springs on the back to haul a bunch of weight. I've got a set of original 500 springs at the garage I'd take $25 for if you'll pay the shipping. PM me if you want them and we'll work out the details. Here's the springs Polaris lists as direct replacements. Mine are off a 2002. 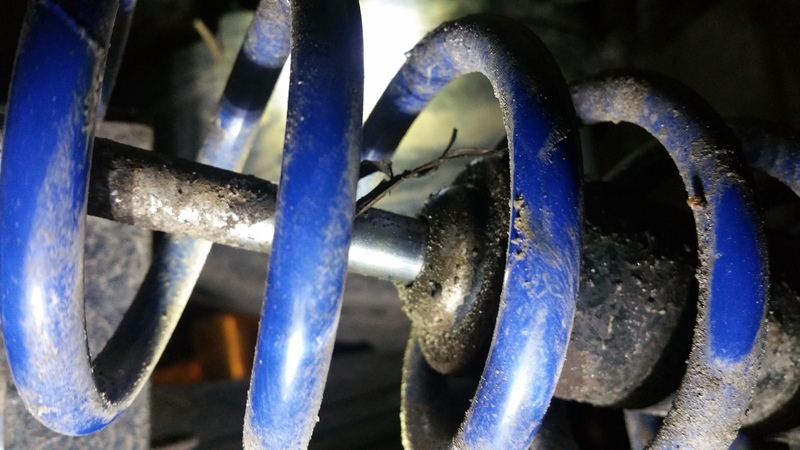 You might want to just buy the entire shock assembly off ebay if you don't want to replace only the springs. There's several listed starting at $30. In those pictures you can see that the shocks are polaris, so im assuming all 4 are stock? You can also see how little they depress, theres only a inch of clean part on the stem. 2 of the pictures are the rear and 2 of the. From what I can tell, the front looks all front stock. And it is indeed softer. And you have got to be correct about the blue shocks. good thinking! 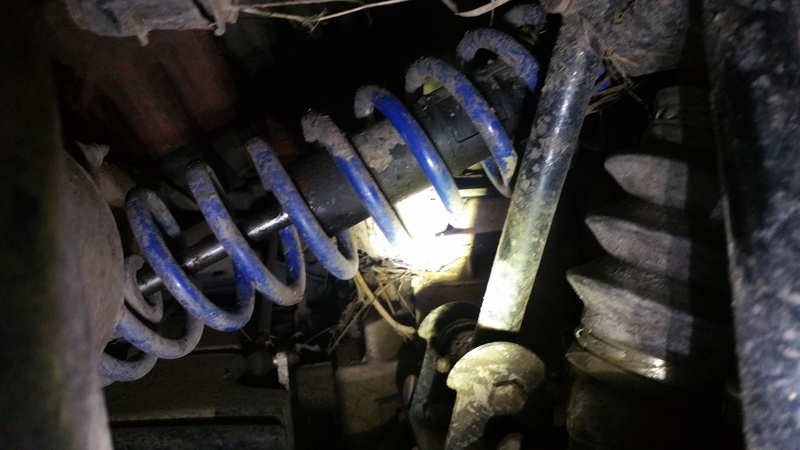 so my shocks might have a good chance of still being good? I hope..
Looks to me like your rear shocks at least are toast. The oil on them indicates they are leaking and may be locked up. That might be the real problem. it sure seemed like those springs had no give. And yet both rears compressed the same amount. They are indeed leaking, and could be seized. But the chances that they are equally bad. Makes me think it's still mostly the springs. Hi all, I just got my first quad. 1998 sportsman 500! Lovin it, but the ride is really rough. Compared to what.... if this is your first quad? 1) Grease all the suspension & drive line zerks! 2) Make sure the shock pre-load adjusters are set as 'low' as possible!! 3) Check tire pressures (just 1-2 psi can change the ride/traction/ect. immensely)!!! Also II'm bouncing in and out of ruts and ditches. Suspension is not absorbing anything so I'm pogo sticking it... fun but not fun, u know? 1) thanks and your right! I will do this when I pull the shock. 3) was done also, no difference in this issue. Last edited by Unitoo1; 03-30-2016 at 08:02 AM.